Vancouver, B.C. – TerraX Minerals Inc. (TSX-V: TXR; Frankfurt: TX0; OTC Pink: TRXXF - http://www.commodity-tv.net/c/search_adv/?v=297763 ) is pleased to announce further assay results from the Company’s 2018 summer field program on the Yellowknife City Gold (YCG) project. A total of 262 samples were taken on the company’s Northbelt target which represents the possible extension of Con-Giant trend and constitutes the core focus area. 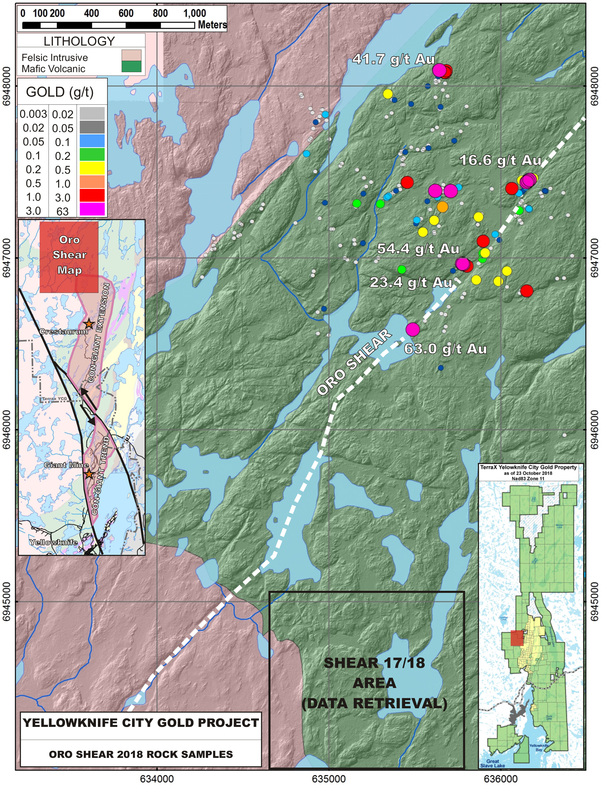 TerraX has also acquired detailed geological maps, channel sampling results, and drill hole logs and assay results from an area southwest of the sampling at Oro, specifically on the high grade Shear 17/18 target (news release August 4, 2015). This work dates from the 1940s and is currently being integrated into our project database. TerraX believes the data accurately reflects past exploration and it will be used to direct further exploration in the area. Assays reported today total 262 samples with gold grades ranging from nil to 63 g/t Au. It should be noted that, due to their selective nature, assay results from grab samples may not be indicative of the overall grade and extent of mineralization on the subject area.